Show your wife how much you love and appreciate her after all these years with a topaz necklace. Each anniversary that passes typically has both a traditional and modern gift suggestion that is associated with it. The 16th wedding anniversary is associated with the modern gift suggestion of silver hollowware. Traditional gifts would include gifts of topaz. The 16th wedding anniversary is also associated with the gemstones peridot and aquamarine. Gifts made of or embellished with topaz are good if you want to give a traditional 16th anniversary gift. For a woman, earrings or a bracelet, watch, necklace or ring made of topaz are good ideas. Men might like a watch or cuff links made of topaz. Topaz comes in many different colors, so it is quite versatile. Some popular topaz colors are yellow and blue. Silver hollowware is the modern gift suggestion for the 16th wedding anniversary. Oftentimes, jewelry is made from silver hollowware, such as necklaces, pendants, cuff links and earrings. Two popular silver hollowware jewelry gifts would include a locket or pocket watch. You can also find ornaments, trinkets and decor made from silver hollowware. Some gifts to consider would be a tea set, frame, jewelry box or silver hairbrush set. The gemstones associated with the 16th wedding anniversary are peridot and aquamarine. Peridot is a semiprecious green stone and aquamarine is a semi-blue stone. Oftentimes, semiprecious stones are made into rings, bracelets, earrings and pendants. You can also find keychains, cuff links and money clips embellished with semiprecious stones. 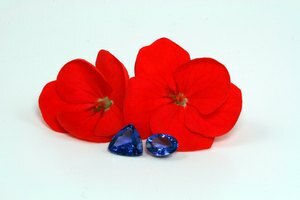 What Is the Meaning of the Lapis Stone? Marshall, Hillary. "Anniversary Gift for Year 16." Synonym, https://classroom.synonym.com/anniversary-gift-for-year-16-12081815.html. 29 September 2017.